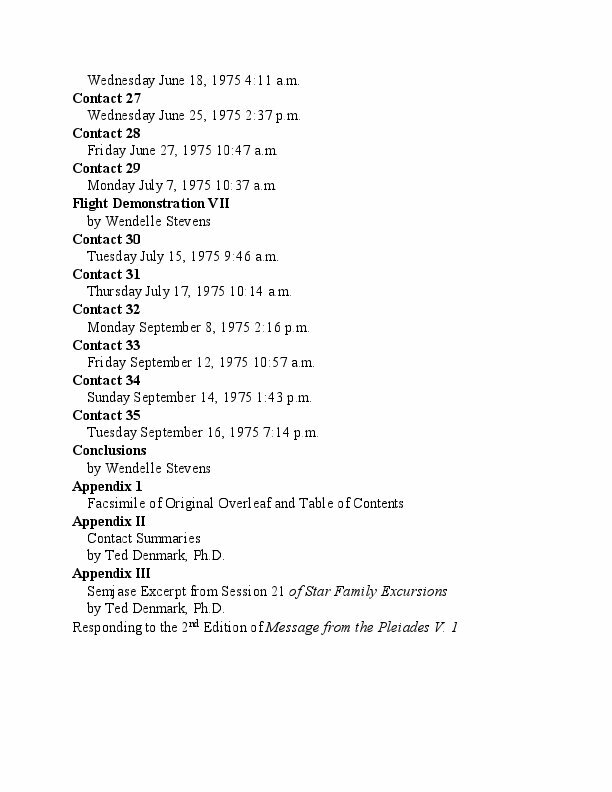 These are the contact notes of the most unusual Swiss farmer Eduard "Billy" Meier as originally presented and interpreted in English as a participant observer by the Dean of UFO/ET studies, Wendelle C. Stevens, in a newly edited 30th anniversary memorial 2nd edition, completely revisioned and rewritten by editor Ted Denmark, Ph.D. with numerous color photos of the ET Pleiadian "beamships" taken by Meier, substituted in place of the black and white versions in the original print book edition. 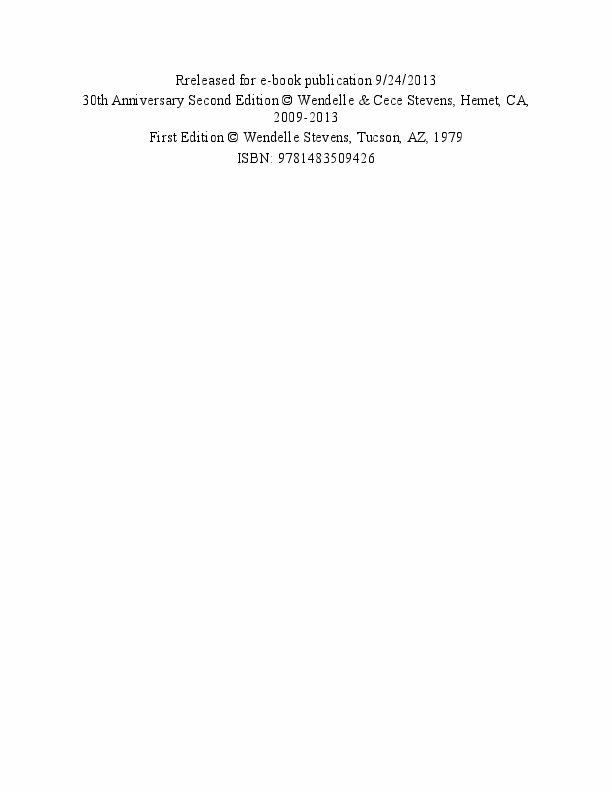 This is the first re-publication in English of the original classic Swiss-German contact reports, out of print for more than 30 years with expanded introduction, appendices and notes. 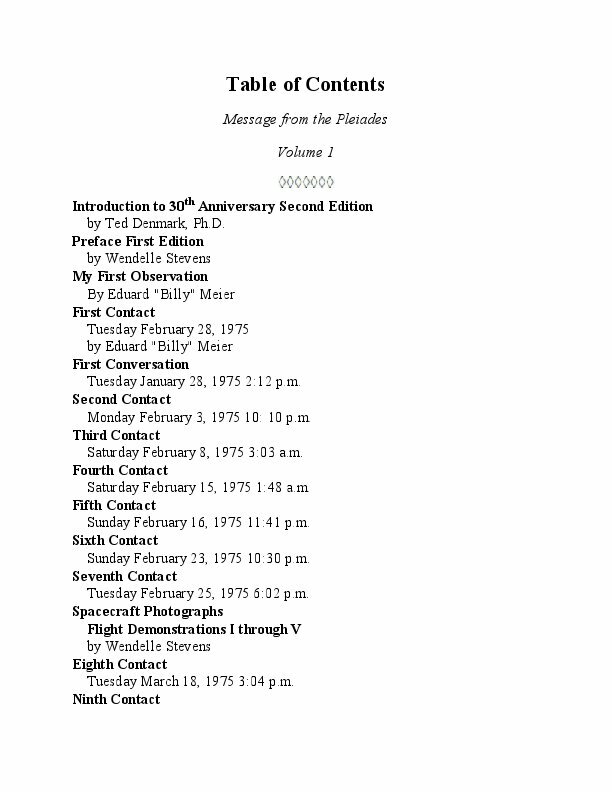 This underground--and still mostly unknown--classic is likely the most important contactee document ever released for publication. 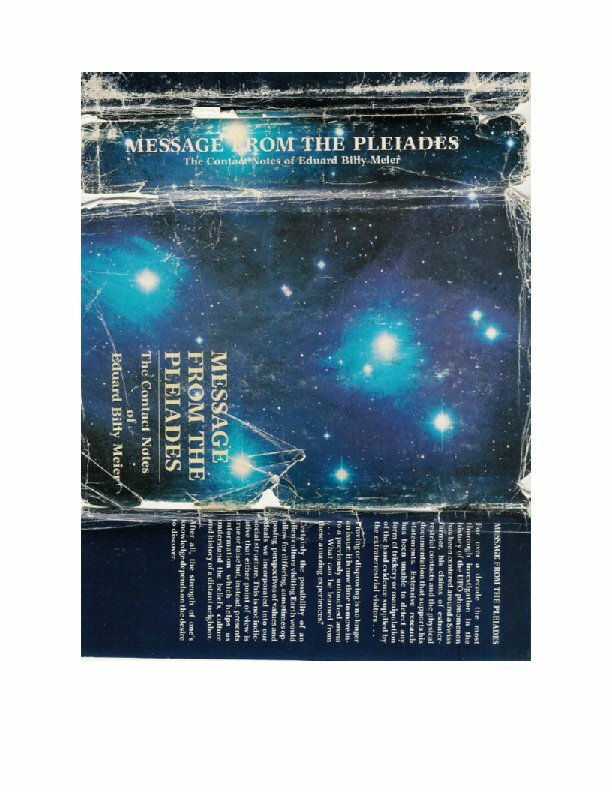 The new 2nd edition Volume 4 appeared first, followed by V.'s 3 and 2 and now finally, the most amazing Volume 1, chronicling the beginning of this extraordinary epic contactee story that is still continuing (2017) and surely ranks among the greatest stories of all time. The greatest breakthrough for us Earthumans in this new third millennium may have been seeded by our having made contact with intelligent extraterrestrial people¾ rather like ourselves—at the three-quarter mark of last century, which is the exotic theme of this UFO contactee story about Eduard “Billy” Meier, a middle-aged Swiss man, often characterized as a “farmer,” groomed by human ETs from the time of his boyhood for this momentous encounter with Semjase, a woman space-time traveler representing her Pleiadian group of Earth-resident human space aliens here to observe and evaluate us, beginning most recently from the time of our 18th Century Enlightenment, and claiming ancient common ancestry with us and similar primordial local galactic origins from the time of a distant destroyed solar system in the constellation Lyra. 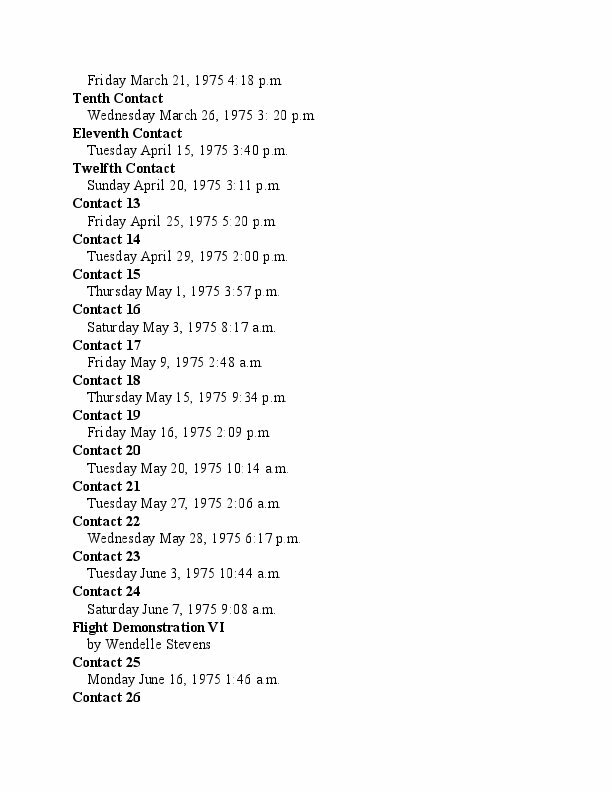 And now, after a period of more than thirty years from the initial contact in 1975, there has been no hint on the part of Meier, now at age 80 (2017) that the narrative is anything but an accurately detailed account of the actual events of the time as transmitted to him by a kind of “automatic writing,” a verbatim telepathic process following each of his contacts with Semjase. 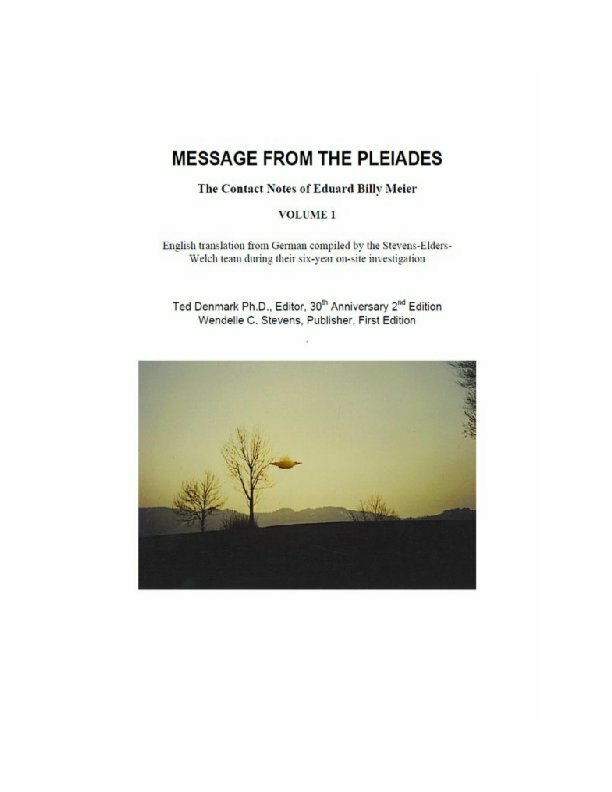 These Pleiadians or Plejarans allowed only partial disclosure of their technical capabilities and capacity for acquiring future fore-knowledge to Billy since we on Earth still have the unfortunate habit of secretly weaponizing our scientific knowledge first and only asking relevant ethical or moral questions later. This was most poignantly shown by the recent mid-20th Century development and testing of the hydrogen bomb by the USA, for which theoretical calculations by the cognizant physicists of the time, revealed that it might have resulted in a nuclear chain reaction extending into Earth’s entire atmosphere. 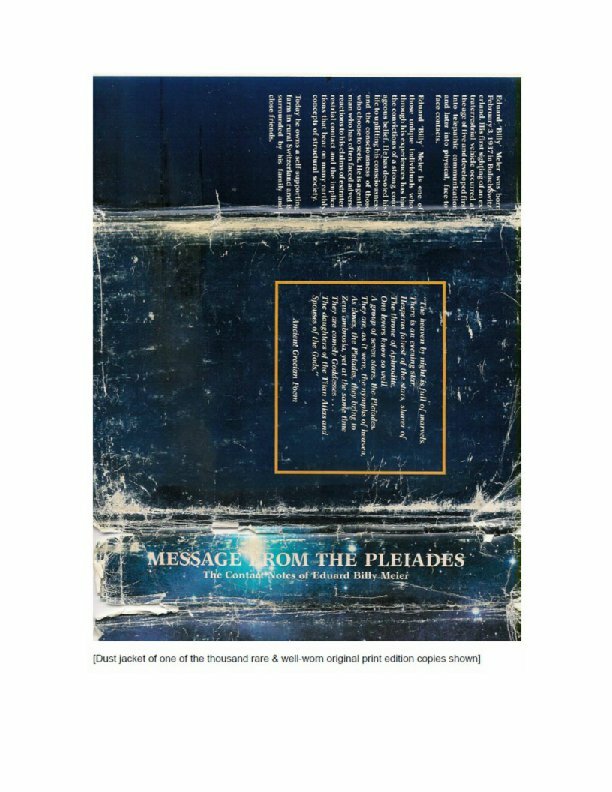 A similar warning about widespread commercial and consumer use of chloro/ fluro-carbons and planned experimental military testing of bromine in atmospheric chemical warfare, were among the major emergency “messages” the Pleiadians were attempting to deliver to Earth at this crucial time. But there was so much more (!). She reveals to Billy, alone and in person—to the continuing consternation of his excluded wife, friends and associates—various aspects of their mission and high level of culture that is almost unimaginably advanced in comparison with that of Earth at our still early stage of technical civilization. Of course stories with similar themes have appeared in many science fiction books, movies and television programs in the latter half of the Twentieth Century (the original Star Trek television series, appearing 1966-1969, is strikingly similar in places, but clearly predates the first Meier contact with Semjase). 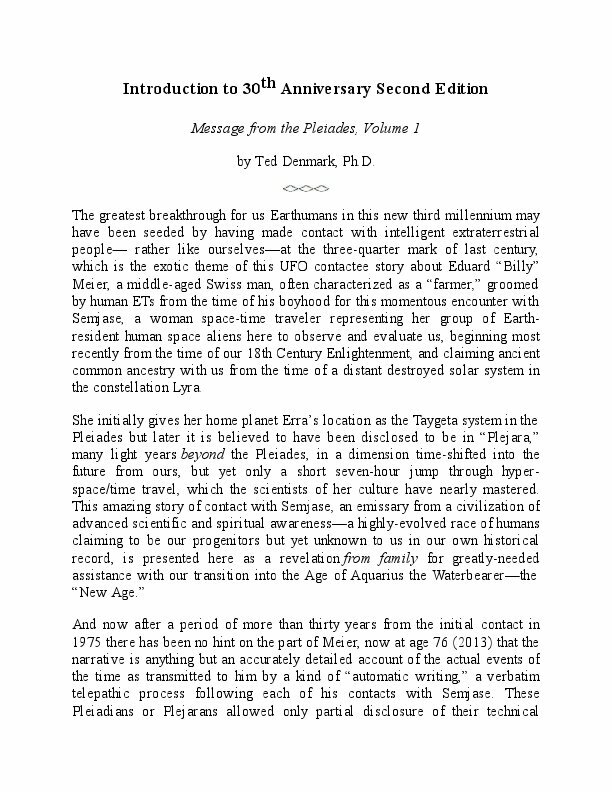 Naturally, the Meier contact story, beginning on January 28 of 1975, with its claim of extraordinary physical ET contact conducted in the native language of the contactee, became well known in UFO circles and immediately generated great controversy, particularly for the striking and now famous pictures taken by him of their spacecraft called “beamships.” Many UFO investigators have termed this Meier case the most celebrated—or skillfully forged—according to the inevitable crew of skeptics and disinformation agents, to ever appear in the public record. And it continues on at present with Meier still in residence with his group at the Semjase Silver Star Center near the small town of Hintersmidrudi near Zurich, Switzerland (now with a new English language web site: www.figu.org). 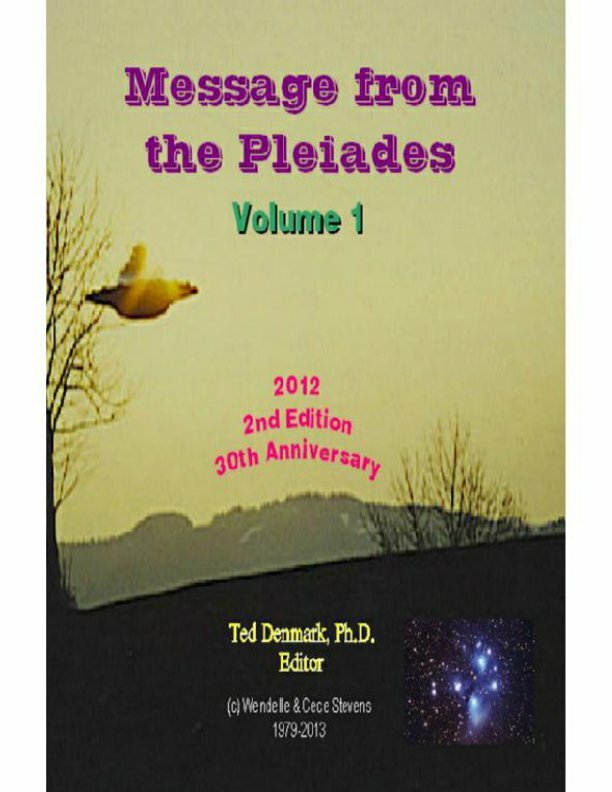 Editor Denmark, like Wendelle Stevens years before, has been completely captivated by the Meier saga for his now own personal reasons of also having become involved with Semjase and the Pleiadeans and never doubts that the Meier story is authentic, even if it is often beyond belief. Ted Denmark, currently residing in the California Motherlode, has lived in Northern California for most of the last 50 years. He attended Rice University for B.A. (philosophy), studied Jungian psychology in Zurich Switzerland and attended graduate school at UC Berkeley where he received his Ph.D. in education psychology in 1975. He worked at UCB Space Sciences Lab as a design engineer for several decades before becoming a computer software engineer at Autodesk. His interests include organic gardening, solar architecture, astrology, ballroom dancing and a wide array of scientific and esoteric studies. 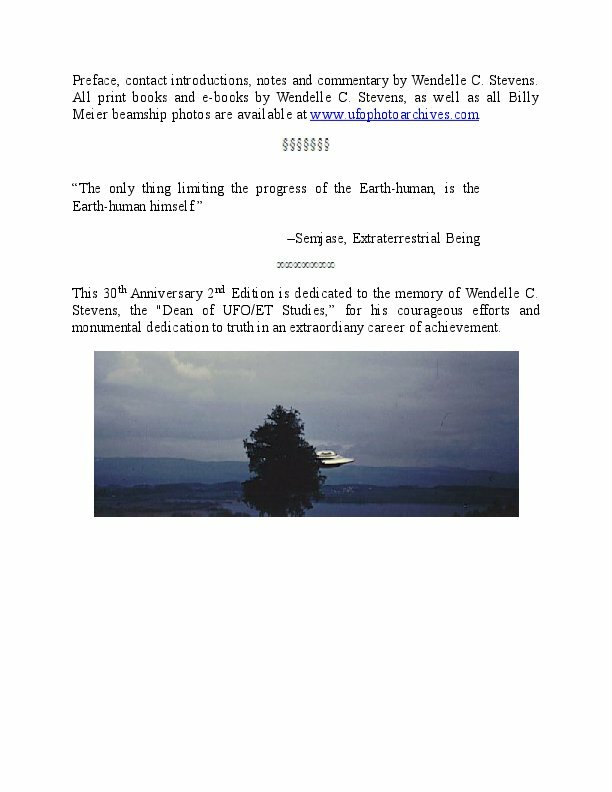 His current retirement career as a writer has been primarily focused on exploring and writing about his contactee experiences over the course of his lifetime.